The distinctive features of an extravirgin olive oil (EVOO) mainly depend on the quality of the olives: integrity, freshness and healthiness. All this preserves the “inner soul” of this fruit that will turn into good oil. Olives are harvested between October and November according to the degree of energy transformation of sugar, that is naturally found in the fruit, into oil. This is a delicate stage that is performed by hand with mechanical tools and simple removable nets. In my constant priority search for quality, it most important to select an oil mill with cutting-edge technology backed with sound innovation. Olives are crushed within 24 hours from harvest in technologically advanced oil mills in a continuous cycle with a low oxidizing impact, known as “cold process”, meaning that the temperatures are always kept below 27° C during the whole process. After the crushing process, the oil is immediately filtered using cellulose fiber filters and stocked in steel containers so as to preserve its quality and its prolong its shelf-life. Following this, the oil is tasted, evaluated and kept separate until the final stage of blending. The oil then undergoes chemical analysis before bottling. 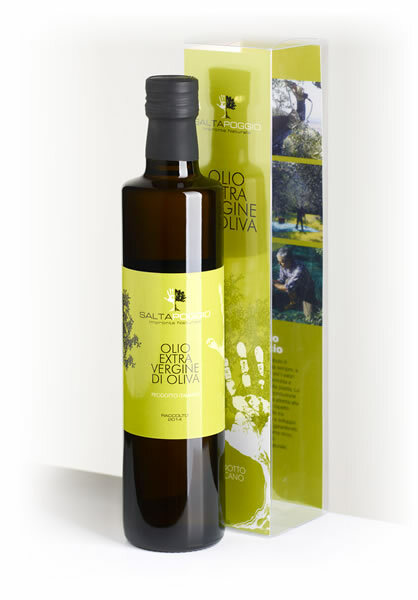 Saltapoggio EVOO guarantees absolute traceability: it’s produced exclusively with olives picked from my trees, in a limited quantity: 100% pure olive juice! Oil can tolerate neither high nor low temperatures and proper storage is important in order to preserve quality, a long shelf-life and avoid oxidation. Oil is stored in steel containers, at a 15°C controlled temperature and protected from light and air, in a dry, clean place so the nutritional properties and aroma remain unaltered. The above-mentioned procedures ensure the oil’s high content of polyphenols, in particular biophenols and tocophenols, that are strong anti-oxidants and prolong the oil’s shelf-life. These substances are active against free radicals, that are responsible for aging and cellular deterioration and are an essential part of a healthy daily diet. I’ve selected a transparent ‘shell’ for my products (both oil and honey), so the contents are plainly visible and transparency and clearness towards my customers are written all over it. Made from the “Frantoio” variety of olives characterized by its intense and fruity aroma as if freshly picked. It has a fragrance of freshly cut grass and artichokes Its elegant taste is balanced and harmonious with a bitter and intense spiciness. Packaged in 250 ml cans or in 100 and 500 ml bottles. It has an intense and fruity flavor typical of green olives and has a fragrance reminiscent of artichokes and almonds. The taste is harmonious and balanced with a slight bitterness and pleasant spiciness. Fresh green olives give this oil its delicate and fruity aroma. It has a harmonious and balanced taste that is pleasantly bitter and slightly spicy. Available in 3 and 5 liter cans.